This user guide is for Travel Phrases – French, but you will find the same features in our other Travel Phrases apps. To listen to the pronunciation of a phrase, tap the French phrase or the pronunciation part. You will need to have Text-To-Speech English installed and enabled. Pico TTS is a typical TTS engine to install. 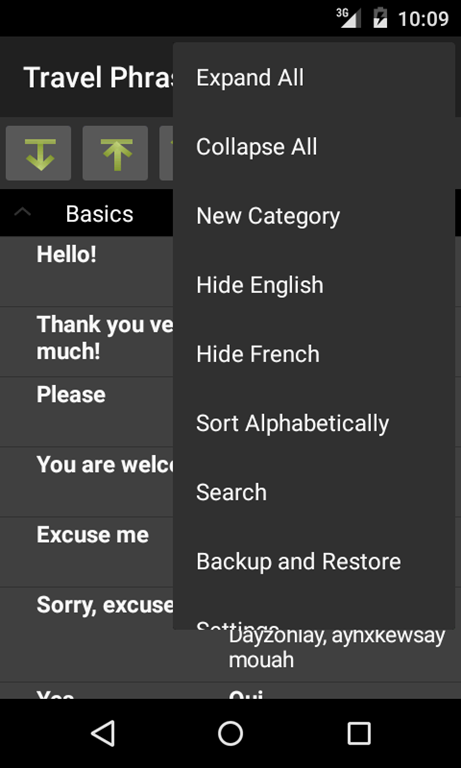 After learning the phrases, you may press "Menu"->"Hide English"/"Hide French" to hide the English or French phrases so you can test if you remember its meaning in the other language. Tap the phrase to reveal the answer. Press "Menu"->"New Category" to add new categories. To edit/delete a category, long press the category and choose "Edit"/"Delete" from the popup menu. Long press on a category, then choose "New Phrase" from the popup menu to add new phrase. 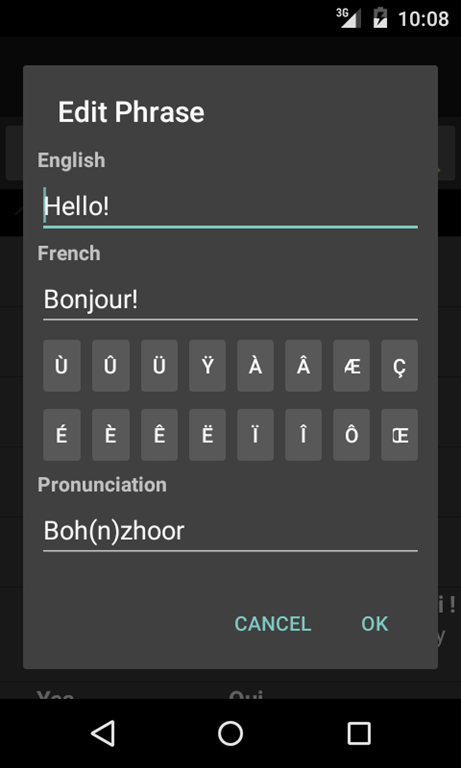 If you don't have a French keyboard, the app provides a small keyboard for entering special characters in French. To edit/delete a phrase, long press the phrase and choose "Edit"/"Delete" from the popup menu. You may sort the phrases alphabetically by press "Menu"-"More"->"Sort Alphabetically". You can also press the space right in front of each phrase, then drag/drop to re-order them. To backup your data, click on "Menu"->"Backup and Restore"->"Backup". Then click on "Backup" to use the default folder or "Select Folder" to choose different location. To restore your data, click on "Menu"->"Backup and Restore"->"Restore". It will open default backup location. Choose the folder which contains backup files and click on "Restore". If you have chosen different backup location, then navigate to that location and click on "Restore". 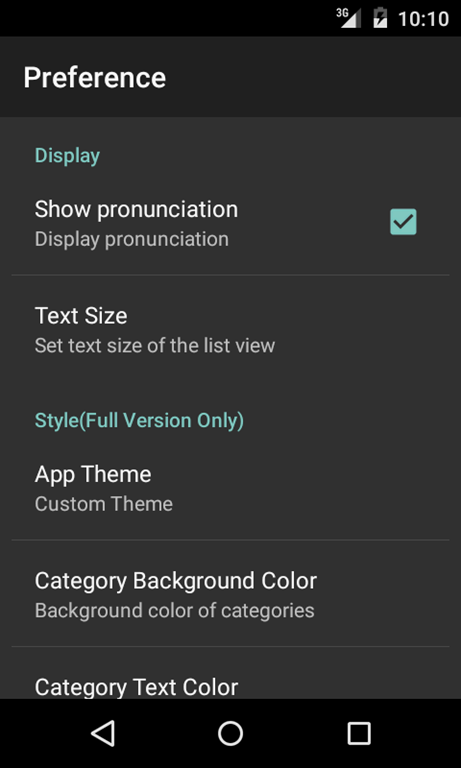 User can choose not to display the pronunciation or change text size in "Settings". In paid version, user can also customize theme and colors. Travel Phrase – French and Travel Phrases – Italian help you to learn and practice basic survival phrase for travel. Not only it has more than 120 useful phrases, but it also allows you to edit and add your own. It uses Text-To-Speech technology to provide pronunciation for each phrase. To help you review the phrases, you may choose to hide the phrases in one language, then try to remember the phrase in the other language. The paid version app doesn't require internet connection and can be used offline.